Fika is, apparently, the Swedish word for coffee break. 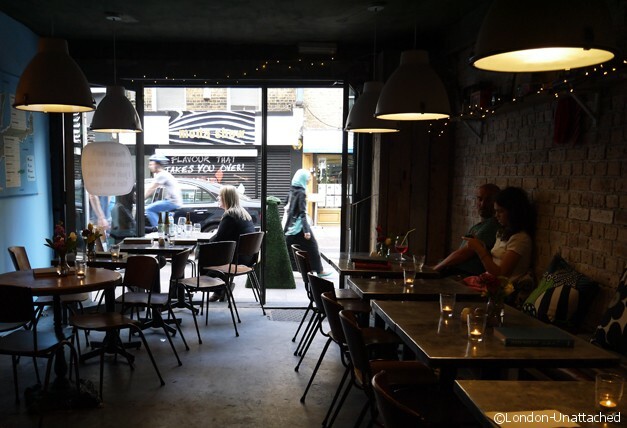 Perhaps the origin of this quirky bar and restaurant in Brick Lane was as a coffee shop? Now, it’s a fully licensed bar and restaurant, open for breakfast, lunch and dinner – and one with a warm energy and optimism. The sort of place where you’d feel out of place if you were in a bad mood. We visited Fika on one of the first warm days this year and when we arrived, early in the evening, downstairs was almost empty. Not suprising really because at the back of the restaurant there’s a hidden staircase leading up to a rooftop bar. It’s the sort of place to relax and enjoy the evening away. And, we were lucky and snaffled the last table. Prosecco to drink (at £30 a bottle) seemed perfect though there are some great sounding cocktails on the menu too. Talking of the menu, there’s something very Swedish about it. Shades of Ikea which at times left me wondering what I was ordering. 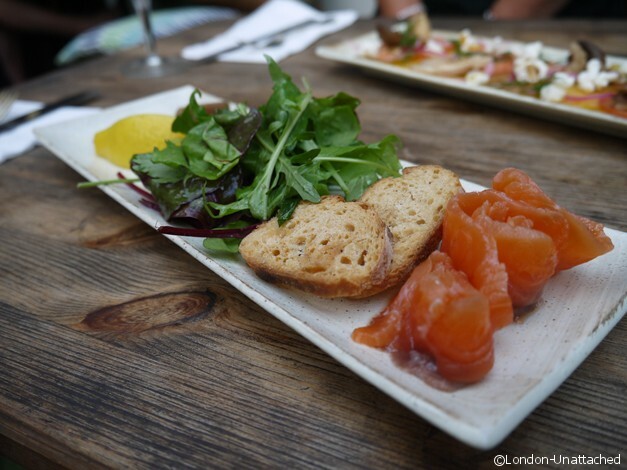 But our starters arrived looking delicious – and I’m pleased to report they tasted as good as they looked . 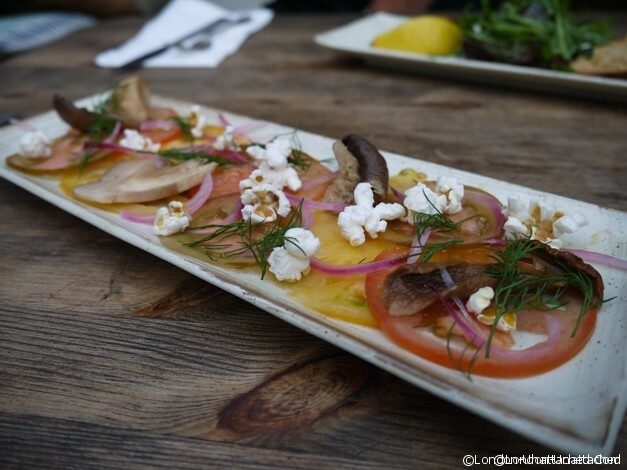 We shared Darjeeling Gravadlax which came with a nice mustardy dressing and Tomato Kingdom, a heritage tomato salad with mushrooms and (slightly superfluous) popcorn! 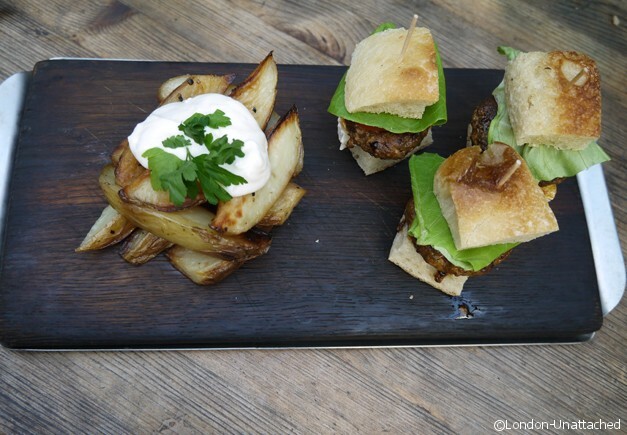 Mains went from the sublimely unhealthy Tenenbaum’s Dinner – three sliders with applewood cheddar, brie and goats cheese served with chips and aioli to the fabulously healthy ‘The Expedition’ – greens with salmon, crayfish and tiger prawns. Great sized portions which left us feeling quite full and not really in need of dessert. I firmly believe one should give in to temptation whenever possible, so we shared. Kladkakka, the sticky chocolate cake, didn’t exactly have an appealing name. 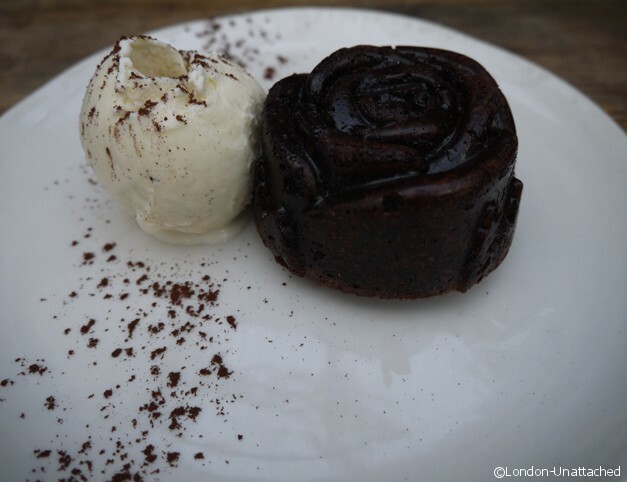 But the rose shaped dense chocolate cake arrived with a generous dollop of vanilla ice-cream. And that should have been enough. 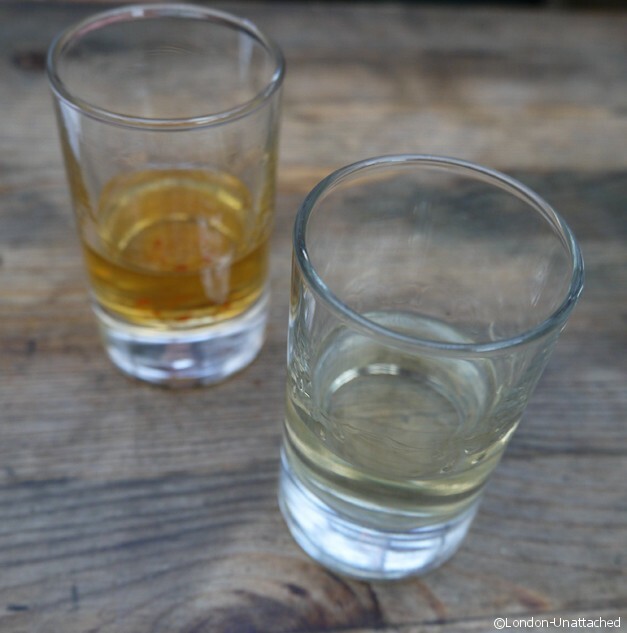 Who could resist a little night cap though? Especially when it’s home-made schnapps – in my case gingerbread. Brick Lane is a little too far for me to be a Fika regular. But if I did live in East London I’m sure Fika would fast become an old friend. And, the roof terrace is just fun – worth dropping in for coffee, wine, food or snacks. The perfect place for Fika. Many thanks to Fika for tine invitation to review- I was not paid for my visit but I did receive free food and drinks. How could you go wrong with an evening flavoured by gingerbread schnapps escorted by a delightfully rose shaped cake? Fika sounds perfect! 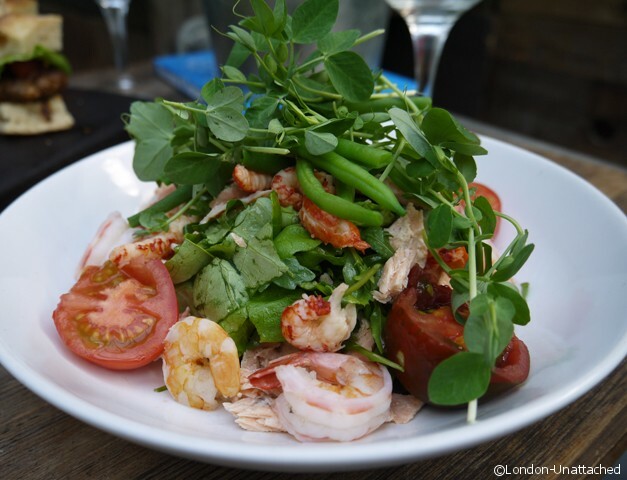 Thank you for the delicious review which has left my mouth absolutely watering! If only I were in East London…. Looks absolutely lovely..might pop in for a visit on the terrace! So Swedish..I would go for the gingerbread schnapps in a big way. Nice combos here for you. Ahh, we have a Fika here that is famous for its coffee! Although ours is set up more like a little coffee bar rather than a proper restaurant, even though it does serves traditional Swedish food along with coffee. Wonder if it’s the same chain? it did have a wonderful atmosphere. And the food was moreish!